Don Broco formed in 2008 but took a hiatus when all four members went off to university. A pact to return to playing post-graduation stuck true, and the ensuing exposure led them to appearances at Camden Crawl and Download Festival, as well as a coveted support slot alonside big-hitters Enter Shikari in 2009. Flash forward a few years and 2013 saw the band hitting the UK Top 40 for the first time with their single You Wanna Know. This was followd by a development in their sound, which by 2015 had grown to encompass funk, dance, and new wave influences. 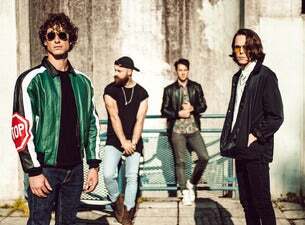 The band comprises of vocalist Rob Damiani, guitarist Simon Delaney, Matt Donnelly on drums and vocals, and Luke Rayner on bass.